These nice muffins make a tasty Sunday breakfast in the fall. They have some of the best of fall’s bounty – pumpkins and apples. 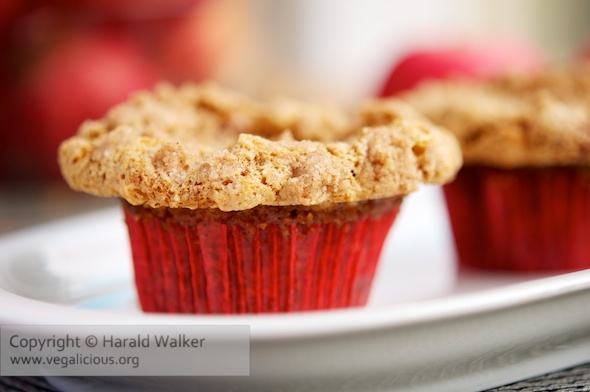 Make the streusel topping by mixing the flour, sugar and spices together. Melt the vegan margarine and stir into the flour mixture, it will be a grainy coarse mixture. Grease 18 muffin cups or use the paper liners. In a large bowl mix the flour, salt and baking soda. In a separate bowl, mix the sugar, and spices, add the pumpkin puree and mix to a smooth consistency. Add the egg replacement and again mix well. Clean and cut the apples in small pieces. Add to the flour mixture. Add the pumpkin mixture to the flour mixture and stir enough to moisten. Fill the muffin tins 3/4 full and sprinkle the streusel topping over. Place in the preheated oven and bake for 30-35 minutes. It’s best to cut the apples in very small pieces, and don’t put too many – not more than the 2 cups, as the muffins need enough dough (batter) to hold together. Posted by Chris Walker on September 27, 2010 in Apple, Breads and Muffins, Pumpkin.